IT’S OFFICIAL – The Yukon Party caucus was sworn into office Saturday morning, while the cabinet was unveiled and sworn in that afternoon. (l to r, front row) cabinet minister Peter Jenkins, MLA Dean Hassard, Premier Dennis Fentie, minister Elaine Taylor, MLA Haakon Arntzen and MLA Brad Cathers. (Back row): minister Jim Kenyon, minister John Edzerza, minister Glenn Hart, MLA Patrick Rouble, minister Archie Lang and MLA Ted Staffen. Premier Dennis Fentie unveiled his cabinet Saturday afternoon before hundreds of Yukoners who packed the government administration building to witness the ceremony. With few surprises, Fentie invited each of the six Yukon Party members who will join him in cabinet to be sworn in one-by-one. And one-by-one, beginning with the premier, they took the oath of office and pledged to maintain confidentiality. “I am proud of our team and I have every confidence that they will accomplish a great deal in the next four years,” Fentie told an audience of some 650 people. • Peter Jenkins (Klondike) - Health and Social Services and the Yukon Workers’ Compensation Health and Safety Board; • John Edzerza (McIntyre-Takhini) - Education and the Public Service Commission; • Elaine Taylor (Whitehorse West) - Business, Tourism and Culture, and Justice; • Archie Lang (Porter Creek Centre) - Energy, Mines and Resources, the Yukon Development Corp.and Yukon Energy; • Glenn Hart (Riverdale North) - Infrastructure, Community Services, the Yukon Liquor Corp. and the Yukon Housing Corp; • Jim Kenyon (Porter Creek North) - Environment. As each minister and Commissioner Jack Cable finished signing the necessary documentation, they were greeted with rousing applause, none more so than the reception for the new Justice minister, the only woman elected on the Yukon Party slate. As he named Taylor and called her forward to take the oath of office, Fentie, the Watson Lake MLA, said he was particularly gratified with the appointment of the 34-year-old, born-and-raised Watson Laker who joined the Yukon Party team 10 years ago as the executive assistant to then-government leader John Ostashek. Taylor, who has worked as a caucus researcher and assistant since the Yukon Party lost its majority to the New Democrats in 1996, earned her seat in the legislature by taking out former Liberal Speaker Dennis Schneider in the Nov. 4 election. The youngest member of cabinet said the Yukon Party will be following through with its campaign commitment to return the Women’s Directorate to a stand-alone department, rather than keeping it under the cabinet office’s wing, where it was moved to by former premier Pat Duncan. As to whether the directorate should eventually fall under the responsibility of Taylor as the only woman in cabinet, she said gender will not dictate who ends up with the portfolio. All party members, Taylor added, are committed to work on behalf of the interest of all Yukoners. In his opening remarks, the commissioner foretold of challenges the Yukon Party will face. Cable suggested that as a litmus test at the end of the day, they should ask themselves if what they did that day would encourage the territory’s youth to become involved in politics. “If the answer is yes, you will have left a positive imprint on Yukon history, and you will have been successful,” Cable said. 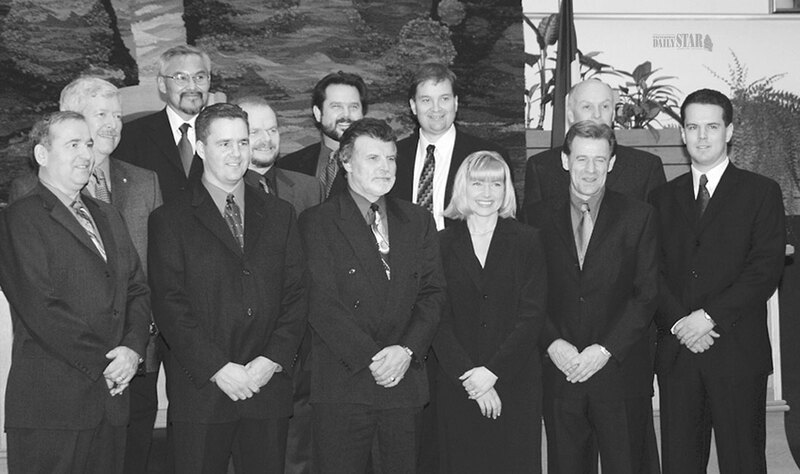 “You and your colleagues will be taking over the reins of government at a time when there are certainly a number of formidable challenges ahead.” Cable said Fentie’s government will be called on to take over control of the Yukon’s lands and resource and to strengthen the relationship between the first nations and the Yukon government. Fentie opened his remarks with a quick quip, suggesting he’d wished Cable had told him before the election about what lay ahead for the new government. But the premier was adamant that his rookie caucus – cabinet and non-cabinet members – remain committed to working as a team on consensus-building, consultation, collaboration and compromise. In an interview afterward, the premier said while the decision of who would sit in cabinet was ultimately his, his selection was based on consultation with his caucus and Yukoners who he knew had a great deal to offer. Fentie said the five MLAs who are not in cabinet – one will have to sit as Speaker – will head up areas of policy work the government deems necessary. Fentie also said his government will not be conducting a sudden purge of deputy ministers, which isn’t unheard of with a change of government. Within the first five months of office, Duncan fired four deputies. By the time the 2 1/2-year Liberal reign ended, 11 deputy ministers had left – seven were fired, three retired and one simply quit. The Yukon Party, said Fentie, has confidence in its senior bureaucrats. Earlier in the day, the entire Yukon Party caucus took the oath of office as elected members of the Legislative assembly. Following the unveiling of the cabinet at 2 p.m., the hundreds gathered made their way from the main foyer to the cafeteria, passing by the line up of new cabinet ministers who were kept busy shaking hands and hugging supporters. For better than an hour, scores of Yukoners mingled while enjoying a brunch laid out by taxpayers. The cost of the ceremony was not available this morning. The party did not stop there, however, as several hundred turned out Saturday night for the official Yukon Party celebration gala, with standing room-only at the Town Hall in the Gold Rush Inn. While Klondike MLA Peter Jenkins was an obvious choice for cabinet as the former leader of the party and the only other experienced caucus member besides Fentie, Jenkins said receiving the responsibility for Health and Social service, the department with the largest budget, was entirely a decision by Fentie. “I offered myself to the premier in any capacity when we spoke and he deemed me capable of fulfilling a role,” Jenkins said in an interview after being sworn in. The veteran MLA of six years said he hasn’t yet laid out a list of priorities, though he noted there must be a review of the workers’ compensation act called before the end of January. Environment Minister Jim Kenyon has had a life of different experiences, ranging from his practice in veterinary medicine, to restaurateur for about a year to his former role as an auxiliary RCMP officer. He said he is somewhat intimidated by his new responsibility. “I am confident, but intimidated, sort of awed,” he said. Kenyon said there are a number of big issues facing his department like the Yukon Protected Areas Strategy, the April 1, 2003 devolution of federal powers to the Yukon and the international debate over the Kyoto protocol. But he’ll need time to get up to speed, said Kenyon. Kenyon said first there was the 31-day job interview – the election campaign – followed by a month of caucus discussions and deliberations. “Now we are down to the point where every time we see a door open, we expect to see five people walking in with two-inch-thick binders,” he said. Education Minister John Edzerza said he was very surprised when Fentie delivered the news of his cabinet selection to the Yukon Party caucus on Friday. Edzerza said he knows some people believe that as the only aboriginal member of the caucus, he had to be appointed to cabinet. But Edzerza said he would like to think it was the same credentials he brought with on the campaign trail – a myriad of experience living in the North and a commitment to making the Yukon a better place – that placed him in the cabinet. Fentie said he made the announcement to the caucus Friday but he declined to say when he actually finished his deliberations and finalized his cabinet selections. “That’s my little secret,” he said.